130 starters and 105 classified finishers. This was Eddy Merckx's fifth and final Tour win and part of one of the most extraordinary seasons for any athlete in any sport. In 1974 Merckx won The Giro, the Tour of Switzerland, the Tour de France and the World Championship. In the 1974 Tour Merckx was fortunate in that Luis Ocaña and Joop Zoetmelk were absent. A tiring Vicente López-Carril was headed for second place but Raymond Poulidor nicked him in the final time trial. This was the final Tour de France to end at the "La Cipale" Velodrome. Tours since have finished on the Champs Elysées. Stage 1: Friday, June 28, Brest - St. Pol de Leon, 144 km. The times of the first five riders for each team were added up to give the team's time. The team's real time was added to each rider's GC time. Final Tour de France finish at "La Cipale"
Merckx came to the Tour with wins in both the Giro d'Italia and the Tour of Switzerland. He started the early season well, winning one of the first races on the European calendar, the Italian Trofeo Laigueglia. The rest of Merckx's spring was not up to his normal standards. For the first time since 1965, his first year as a pro, he didn't win any Spring Classics. It wasn't for lack of trying. In 1974 he entered 140 races but won only 38 of them, a sharp fall-off from his 51 victories the year before. He produced second places in both the Catalonian Week and GentWevelghem, a third in ParisNice and was fourth in the Tour of Flanders, ParisRoubaix and the 5 Days of Dunkirk. Health problems got in the way. Writers described his difficulties differently. Some write about his having the flu. Merckx himself says he had a sore tailbone. Immediately after winning the Tour of Switzerland, Merckx had surgery on his perineum. The surgery was performed on June 22 with the Tour starting on June 27. As one might expect, the wound from the surgery never healed during the Tour and it gave him trouble the entire time. He would often end the stages with a bloody chamois. With the exception of the Classics, his list of 1974 victories is stunning: Giro, Swiss Tour, Tour de France and the World Road Championship. But the wins weren't generally coming with the same ease. He was starting to get a little ragged at the edges. If Merckx had been anything less than a Nietzscheian siege engine of will his career would surely have been longer but perhaps his win list shorter. Denying the world the rematch everyone wanted, neither Zoetemelk nor Ocaña entered the 1974 Tour. Zoetemelk crashed in the Midi-Libéré and ended up in the hospital with a life-threatening case of meningitis. Ocaña crashed while racing in a 4-day pre-Tour tune-up race, the Tour de L'Aude, and went home. From that point he failed to communicate with either his sponsor (Bic) or his Director Sportif, Maurice de Muer, and was fired. The other great hope, Bernard Thévenet, even though he started the Tour, was hopelessly banged up from several crashes in the Vuelta. The 1974 Tour remained about the same length as the year before, 4,098 kilometers. Counting split days as individual stages, the Tour organization crammed 27 stages and 2 rest days into the 3 weeks of racing. There were fewer of the onerous transfers that had reduced 1973's peloton into a surly, slow-moving group of exhausted riders but they were still a source of vigorous complaint. For the first time the Tour went to England for a stage. 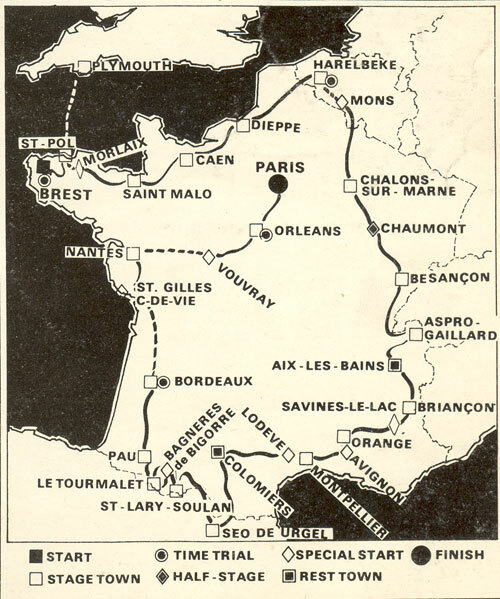 The 1974 Tour went clockwise, starting in Brittany, circling the perimeter of France before heading inland for Paris a couple of stages after the Pyrenees. If there were any doubts about Merckx's form they were laid to rest with the 7 kilometers of the prologue, which Merckx won. His very loyal teammate, Joseph Bruyère, was third at only 8 seconds behind. The next day in the first road stage, Bruyère got in the winning break with Herman van Springel (who did all the work) and Ercole Gualazzini (who won the sprint). Because of his excellent prologue, Bruyère took over the lead in General Classification. It doesn't look as if this was the way Merckx wanted it to play out. From the very first intermediate sprint Merckx was out dueling with the sprint specialists, fighting for the bonus seconds in play. It looked as if Merckx was out to do what had not been done since Romain Maes in 1935, he wanted to take the Yellow at the start of the Tour and hold it all the way to Paris. Van Springel's ambition foiled the grand plan. Bruyère is an interesting rider. His career was devoted to one thing: helping his good friend Eddy Merckx win races. He followed Merckx from team to team, always riding as hard as he could to help Merckx, never thinking of himself. Merckx said that Bruyère almost never realized how good he was, but when his morale was high, he had the power to pulverize the field. The second stage was held in Plymouth, England. The entire Tour was ferried in a big, tiring transfer to race on a yet unopened highway. The riders were livid because British Immigration held them up as they tried to fly back to France. British racer Barry Hoban said that he wasn't back in his hotel until 10 at night. The experiment was sufficiently disliked that it was over 10 years before it was attempted again. By virtue of the intermediate bonus sprints, Merckx regained the Yellow Jersey from Bruyère after the 4th stage. It was a tenuous hold: only 4 seconds separated Merckx from Bruyère. And it was actually more tenuous than that. Gerben Karstens was second on that stage but felt that he had been victimized by collusion between Merckx and Belgian super-sprinter Patrick Sercu. Even though they were on different teams, Sercu and Merckx were lifelong friends and partners during the winter track season. Karstens felt that Merckx was helping Sercu earn the points leader's Green Jersey. Karstens was so furious over Merckx's friendly help that he failed to report to dope control on time. For this serious infraction, Karstens was penalized 10 minutes. Upset, the riders threatened a strike over what they perceived as an overly hard punishment. The next day he was reinstated and with the time bonus for his second place, Gerben Karstens was in Yellow with 2-second lead on Merckx. As the Tour moved across Northern France and into Belgium and then back into France the sprinters (Merckx included) fought hard for the dribs and drabs of seconds that were available. Because the lead was so close it changed several times. The first day in the Alps, stage 9, had 2 hard climbs. At the start of the second and hardest ascent of the day, the Rousses, all the major contenders were together. Spanish champion Vicente Lopez-Carril tried to get away but with several kilometers of hard work Merckx was able to bring him back and in the process, dropped all but 11 others. The big surprise was 38-year old Raymond Poulidor's escape near the summit. He was caught on the descent but it was a shock to see the man who had first ridden the Tour in 1962 drop Merckx, Joaquim Agostinho and Italian climbing specialist Wladimiro Panizza. Merckx won the stage but it required grit to chase down the attacks. It appeared that even with several of the best stage racers sitting this Tour out, the others were in no mood to let Merckx have anything without a fight. On the other hand, Merckx was clearly willing to battle for every scrap on the table. The next day was a variation on the same theme. There was 1 major climb, the 1,500 meter Mont du Chat. Lopez-Carril's teammate Gonzalo Aja took flight near the summit with Poulidor hot on his wheel. Poulidor caught Aja on the descent but they couldn't keep Merckx from joining them near the finish. Merckx, being by far the superior sprinter, took the stage. The riders had a day of rest before tackling the hardest Alpine stage with the Cochette, Grand Cucheron, Télégraphe and Galibier on the day's schedule. The better riders arrived at the foot of the Télégraphe together. The Télégraphe really must be considered part of the Galibier because after the crest of the Télégraphe there is only a short descent and then the Galibier proper is ascended. As the peloton climbed the Télégraphe the cream of the Tour, its 13 best riders including Merckx, Poulidor and Lopez-Carril, rose to the top. Thévenet was able to get into that group and then faded slowly back, eventually abandoning. Near the crest Lopez-Carril took off with Merckx chasing. The riders came together again and then Roger Pingeon (winner of the 1967 Tour) attacked and took Lopez-Carril with him. Again Merckx had to chase but this time with Lopez-Carril's teammates Aja and Galdos on his wheel. Again Merckx caught Lopez-Carril and again the Spaniard attacked and got a gap. This time he made it stick. Lopez-Carril must have taken terrible chances because he actually gained time on Merckx on the descent. Once off the mountain he raced the final 20 kilometers to the finish line in Serre Chevalier as if he were being chased by the hounds of hell. Cannibal, Hounds of Hell, it was probably all the same to Lopez-Carril. And he did it! After attacking Merckx over and over and finally getting free, Vicente Lopez-Carril arrived at the end of the stage with a 54-second lead on Merckx who had Galdos and Aja glued to his wheel. Merckx was in an impossible situation. If he were to slow down and avoid dragging Aja, Lopez-Carril would close in on Merckx in the General Classification. Continue chasing as hard as he could and he drags Aja along on a free ride and helps a dangerous rival. No good choices. Pingeon came in 2½ minutes later. Poulidor had come apart and although he had a good, high placing at tenth, he lost 6 minutes, 17 seconds. The next day included Mount Ventoux, but not as a hill-top finish. The riders ascended the windy mountain in blistering heat and came together on the descent. A very complex set of time bonuses for the first riders over the Mount gave Aja a couple of seconds over Merckx while Vicente-Carril lost a half-minute. The stage was won by Merckx domestique Jozef Spruyt, in a small break that escaped on the final run-in. Across Provence the sprinters fought for stage wins and Hot Spot sprints in stifling heat, racing that didn't change the General Classification. Stage 15, the first Pyrenean stage, had only 1 major ascent, the Port d'Envalira, famous in Tour history as the scene of Anquetil's famous crisis in the 1964 Tour. Only about 15 riders were with Merckx at the crest of the climb but the real adventure was just a few kilometers from the finish. Right behind Merckx and the others in the front of the break, a crash took down Poulidor, van Springel, Galdos and several others. Galdos, who was sitting in sixth place, turned out to have a hairline fracture in his femur. He was an important part of the Spanish challenge and now Aja and Lopez-Carril would be without his valuable services. Raymond Delisle on a lone break rides through the fog. He was first over the Port d'Envalira but was caught and finished ninth in the lead group. Merckx won the stage. When stages 15 and 16 took the Tour into Spain, Basque separatists bombed some of the team and press cars. Lopez-Carril, who was the Spanish Champion, wore the blue and green Kas colors those days rather than tempt fate by wearing the champion's jersey which sported the colors of the Spanish flag, thereby being a target for the Spanish-hating partisans. By the time the Tour returned to France no one had been hurt but it gave everyone a very justifiable scare. Stage 16 was 209 kilometers from Seo de Urgel to St.-Lary-Soulan/Pla d'Adet. The riders would climb the Porto de Canto, the Porto de la Bonaigua, the Portillon, the Peyresourde and a final ascent to Pla d'Adet. The important riders arrived at the base of the final climb together. On the lower slope of the climb to Pla d'Adet van Impe's teammate Willy van Neste took off with Spanish Miguel-Maria Lasa, a teammate of Lopez-Carril, rushing off the front to join him (Lasa later came off and finished over 7 minutes down). And then who emerged from the front of the peloton? Raymond Poulidor! Poulidor chased, caught and dropped van Neste and was off the front of the final climb, alone. Back in the front group Lopez-Carril attacked and dropped Merckx who was now looking haggard. Alain Santy, a member of Poulidor's Mercier squad took off as did Belgian rider Michel Pollentier. Merckx dug deeper, struggling to keep the fleeing attackers in sight as the gradient in the final meters approached 24 percent. Poulidor held his lead for a brilliant stage win with Lopez-Carril 41 seconds behind. Merckx finished an exhausted 1 minute, 49 seconds after Poulidor. He was still in Yellow but there were 2 more days of Pyrenean mountains to go. Stage 18 gave the real climbers a final chance to gain time. In this last mountain stage they would not only have to mount a serious attack that would crack Merckx, but also forge a gap that would withstand 2 more individual time trials totaling 50 kilometers. This was a tall order. After only a few kilometers into the stage the riders went over the Tourmalet. Lopez-Carril, showing some wear and tear, came off but clawed his way back to the leaders. On the final climb, the Soulor, Danguillaume got into a small group, none of whom posed any threat to the Overall. The group was allowed its freedom. For the descent and final ride into Pau, Danguillaume had his rear wheel changed, not because he had a flat tire, but because he wanted bigger gears in order to force the hot pace he needed to stay away. And stay away he did, getting his second consecutive stage win. Back in the peloton all the contenders stayed together, more or less conceding the Tour to Merckx. 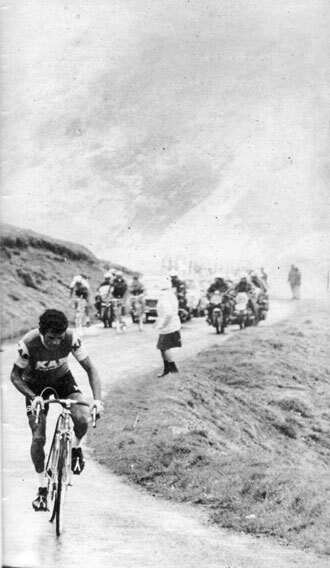 Stage 18: Aja attacks 3 kilometers from the summit of the Tourmalet, dropping Delisle, Poulidor and Merckx who can be seen a bit back down the road. The full extent of Lopez-Carril's exhaustion was clear after the stage 19b time trial. 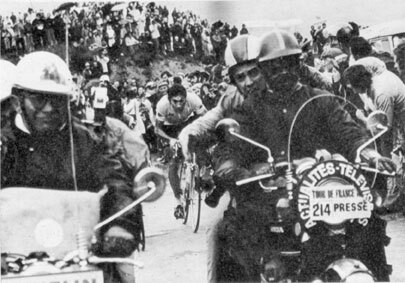 Only 12.4 kilometers long, the Spaniard lost almost a full minute to Merckx, who won the stage. The final time trial contained a surprise. Michel Pollentier, a small rider on the Belgian Carpenter team won the 37.5-kilometer stage 21b individual time trial in Orléans, beating Merckx by 10 seconds. That was interesting but the bigger news was the gap between Poulidor and Lopez-Carril. Poulidor beat the Spanish Champion, described by cycling writer David Saunder as "looking positively ghastly" after his ride, by 2 minutes, 17 seconds. That lifted Poulidor to second place with the huge gap of a single second. On the final stage to Paris Poulidor's Mercier team was able to help him gain a few more seconds of time in one of the intermediate sprints. Lopez-Carril's team was too tired to defend their leader. The race was Merckx's and Poulidor had another second place. Merckx's 1974 Tour win allowed him to, first of all, equal Anquetil's 5 victories, but unlike Anquetil Merckx had so far won every Tour he had entered. By winning 8 stages in 1974 he now had 32 stage wins, finally passing the record of 25 owned by André Leducq. He is also the first and only man to have won the Italian, Swiss and French Tours in a single year. This record is astounding because it entailed racing from May 16 to July 21 with very little rest. In addition, in the few days between the Swiss and French Tours he had surgery. Clearly the Merckx of 1969 was long gone but the 1974 Merckx had shifted his tactics, scrambling for little time bonuses, conceding nothing, fighting for everything. This time, it was not in the spirit of tyrannical excess but out of necessity in order to fend off a peloton that no longer feared him. 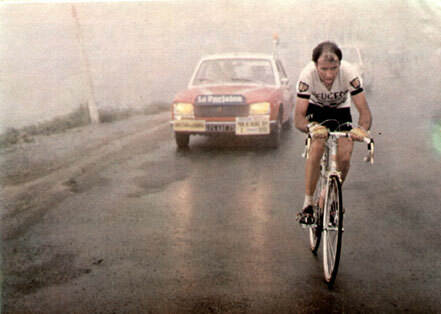 Stage 18: Here's Merckx on the Tourmalet. He finished the day ahead of Aja.